Well, we did it! We made it to the Rose Parade and Chris marched all the way; with his Sousaphone aka Tuba!!! It was tough but he hung in there and they were AWESOME!!! This was so worth all the driving, dogs (who had to come due to doggie neurosis), LA traffic and just general craziness! 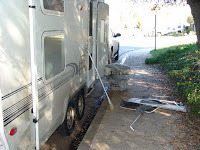 We took our travel trailer and had some interesting moments along the way, but we enjoyed the whole adventure. Ok so where to start? Hmmmm the beginning may be the best place and our excellent adventure began on December 27th as we said goodbye to Chris and with our trailer, trailing behind the truck we set off down the road! Our first night was spent in a Moss Landing on HWY 1; were we were fortunate enough to get a spot that we didn't have to unhook the rig. Well, we had the electric brakes installed quite a while ago, but this was the first time using them; and alas we woke up to a completely DEAD battery on our truck! UGH!!! There was a little stress and cursing, but a great guy helped u s out and we took off again. After a lot of discussion we decided that it must be the electric brakes that caused the problem and from then on we unplugged whenever we were stopped lo nger than a nano second! Now that we are back we will be calling the installer (who shall remain nameless, as everyone makes mistakes GRRR) and have them correct this problem!!! Ok on the road again! Next stop Pismo Beach and again we lucked out and didn't have to unhook the trailer (unplugged it though) and the weather was amazing!!! 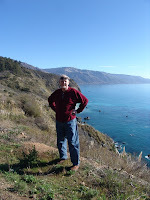 We both love HWY 1 and just couldn't believe our luck with the weather and holy cow; where are the bikes babe?? Oh yea, freezing cold at home and lots of snow! 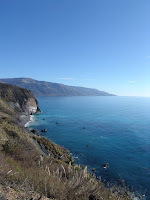 I can't wait to ride down to the coast on Mariah, but I digress, sorry...We enjoyed this drive immensely and our next stop was San Juan Capistrano and Geoff's brother's place! Very nice Chris and Katherine! Thanks for the hospitality and driving up to Pomona to see us on our last night! You two are the best! So after Piglet ate our trailer due to the falling acorns on the roof...sheesh, Piglet, you just wouldn't make it in the wild; we just (barely) made it to Bandfest to see McQueen play. (note the wreckage on the sidewalk and the guilty dogs watching me clean up, Piglet is on the right) Thanks to the guy at Amco in Pomona, who helped us out with GREAT directions. Geoff decided (since I was weeping) to stop and ask for help finding the RV Park, phew, we made it with literally, 2 minutes to spare. This is where we actually got to speak to Chris and not just text! Hi Chris! Are you having fun? Do you have enough money? Hug, hug, kiss, kiss; later gator! Oh yeah, TUBAS ROCK! Of course the band was great and I ran arou nd and took tons of pics! Gee whiz Mom, give it a rest! So on to the next day, which was New Years Eve, WOOOHOOO! That Uncie aka Chris (Geoff's brother) is a car nut, buff, expert, well you get the idea! He has his first muscle car, a 1976 (?) Pontiac Firebird, which is restored and beauuutifulll; took us into Pasadena too have coffee and see some of his friends muscle cars! Oooohhhh, neat! If you didn't know I was into muscle cars way back when and had a Dodge Challenger 340 Six Pak; which if I had put in the garage would be worth something today. I was a dumb kid and couldn't afford the $79.00 a month car payment on the thing, DUH !!! At any rate, we saw some cool cars and met one of Chris's friends. 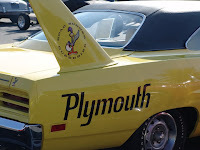 Here is a tail fin on a Plymouth Super Bird, that is not a common car and can be yours for only $150,000.00. I think the guy is nuts, but it never hurts to ask right? So now on to tracing our route for the morning drive to the parade parking at 4:00 am! 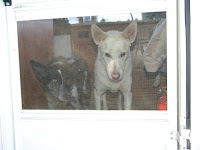 Oh yeah, first Piglet got her tail caught in the door (just the big rubber seal, no injury) and she got grouchy and then Sierra decided to start snapping and I had to sit in between them to calm them down. It was not really a hardship as the two brothers had lots to say to each other about which HWY to take, where to turn, and who's map (electronic or paper was the best). Of course I must admit that every once in a while I had to pipe up and put my 2 cents in! We finally got there and figured out the best way to go, which freeway exits would be open, and well the general condition of the universe, ahhhh all is well! I had tickets to see the float decorating, but alas, these two were kinda spoil sports and I didn't get to go, boo hoo, boo hoo! I have to admit that I was a bit tuckered out by now. The LA basin is just drive, drive, drive and maybe if you are lucky you will get somewhere. Of course we won't talk about the SMOG, hmmm, I guess I just did; it is incredible! It did make me appreciate home, even with the summer like weather. Ok so we had a quiet evening and went to bed at 8:00 pm; 8:00 pm on New Years Eve! What's up with that? 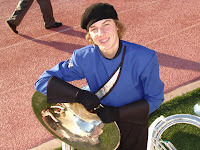 Oh yeah, we are going to see our boy march in the Rose Parade! Didley dee dee! Hmmmm, what's that? Ahhh I remember the 4:00 am alarm, ok up and at em'!! Here we go, tickets, check, water, check, coffee, check, dogs, check, camera, check; let's ROLL! Holy cow I am so impressed, we got to the parking lot without a hitch and got to walk around and see the floats; find the porta potties and just settle in to a wonderful day! 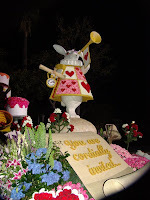 I took pics of some of the waiting floats! 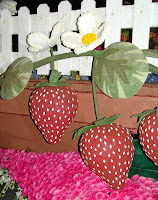 They were amazing and to think they are made completely of flowers, seeds and the like! So many of them were animated and it was so cool to see them coming down the road later in the day! The people were so nice and handing out flowers! 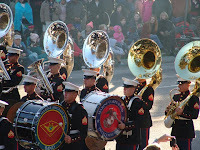 Clorus Leachman was the Grand Marshall and we had the Marine band in front of our seats for sometime and it just makes me choke up to think of the amazing commitment of these young people. When they started playing and marching I did shed a bit of a tear in thanks for their service. Of course it looks like I am a little fixated on Tubas, hmmmm I wonder why? 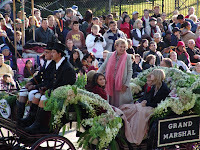 The parade really was awesome and I have to say I just couldn't get over the organization of the whole thing! Here is a video that one of the McQueen Band parents found of the band marching the parade. My friend Dannette was texting me and sending me pics from her TiVo?? That was cool Dannette! How did you do that? Even my stepdad called to find out what order they would be in and watched! Our neighbors watched, that Uncie recorded it and thanks to all of you for your support. The band worked hard to get here and raise the incredible amount of money to do this trip. They got a 6 day vacation, marching in the Disneyland parade, riding roller coasters, and just generally being kids! How cool is that? Well, that evening (after a nap for all of us, dogs too) Chris and Katherine came to our camp site and we all went out for a nice dinner. Thanks for coming all that way to see us off! It's time to go home though and we will be glad to get there. Geoff is talking about going the long route through Death Valley, NOT! Let's go it's supposed to be snowing and there is fog here, sheesh! We did the drive home in one day and we are all very tired! Chris got home the next morning about 7:30 and we were really glad to be here to pick him up! Happy New Year to all and may you have all that you need this year! Yay! That sounds just wonderful, what an awesome experience for Chris! Happy New Year, see you soon, ps I have your haircut now! Love it! It was so fun to watch! I could not wait to see McQueen march loud and proud. Thanks for putting up with my annoying (distracting) text messages! !